The Hair Clinic Hair Extensions Center carries the widest variety of 100% Virgin Indo-European Remy Human Hair Extensions, dyed only once. The Hair Extensions Center carries in stock at all times, in at least 35 colors or more, and in 3 different lengths, the following types of Hair Extensions: Clip Extensions, Tape Extensions, Keratin Extensions, Hot Fusion Extensions, Cold Fusion Extensions, Tape Fusion Extensions, Microlink Extensions, Hand-Grafted Clip in Extensions for Volume, Hand-Grafted Tape-in Extensions for Volume, Loop Extensions, Halo Extensions, Hair Makeup Extensions, Weft Extensions, Weave Extensions and Pony Tail Extensions. The Hair Clinic Hair Extension Center installs a wide variety of Fusion Hair Extension Systems in-house. Permanent Fusion Hair extensions installed at The Hair Clinic include Hot Fusion Extensions, Hairdreams Extensions, Cold Fusion Extensions, Tape Extensions, Loop Extensions & Microlink Extensions. The Hair Clinic also installs hair extensions purchased elsewhere. You may also choose to simply purchase your extensions at The Hair Clinic Hair Extensions shop, and have them installed by your very own stylist. It’s so very important to have your extensions installed by a professional. Permanent fusion installations by a non-professional may damage your hair by pulling it out. You can bring our ultra high-quality hair extensions to your hairdresser for your installation. Please ensure that your stylist has the proper training for the specific type of quality fusion extensions to be installed. Our highly trained professional staff at The Hair Extension Center has over 20 years of expertise in installing all types of hair extensions. You can rest assured that your extensions will be installed in a manner that will give you beautiful, silky hair, with no damage to your hair, no pain, and no adverse effects whatsoever. Installing fusion hair extensions is a delicate art, and the importance of an excellent installation cannot be over-emphasized. Contact The Hair Extensions Center to book your free consultation appointment. We’re located at 2070 Crescent, between Sherbrooke & de Maisonneuve, on the 2nd floor, above Boutique California & Rouge Nail Bar. The Hair Clinic Extensions “Platinum” Grade Hair is simply pure, shiny, silky ultimate quality 100% Virgin Human Indo-European Remy Hair, dyed only once. The Hair Clinic carefully selects Virgin hair from the finest Hindu Temples of Northern India, and color processes it only once. The Hair Clinic labs have redefined the delicate art of processing 100% Human Virgin Indo-European Remy Hair, without compromising its quality. The Hair Clinic Labs gently lighten the hair with UV Light and dye the hair with harmless heat activated pigments, avoiding harsh ammonia & damaging peroxide, while locking in shiny healthy color. Why is hair quality important? Platinum Grade Hair means that you get the absolute best quality 100% Human Hair which stays shiny, silky and flowing as though it were your very own healthy growing hair. Platinum Grade hair lasts 12 x Longer than Bronze Grade hair. Platinum Grade hair lasts 6 x Longer than Silver Grade hair. Platinum Grade hair lasts 2 x Longer than Gold Grade hair. Platinum Grade hair may cost you more at first, but it’s way less expensive in the long term, because it lasts so much longer. Most importantly, Platinum Grade hair will not damage your hair. Lower quality hair tangles terribly pulling out your hair at the root each time you brush and breaking your hair causing significant damage. Unlike Bronze Grade hair, The Hair Clinic Extensions’ Platinum Grade Hair has absolutely no animal or synthetic content. The Hair Clinic Extensions : Supreme Platinum Grade quality, pure 100% Human Indo-European Remy Hair, at the Absolute Best Price! Human Hair is like a tree…it has a cuticle on its outside to protect the inside of the hair just like the bark protects the wood of a tree. On the inside, human hair has a cortex, just like the wood of a tree. Most hair extension brands strip their hair’s cuticle with acid exposing the core of the hair or cortex. Their hair is then bleached, dyed, and dipped in silicone at high pressure, for temporary silkiness & shine.The problem is, the silicone lacquer washes out days later, the hair looses it’s shine and begins to crack & tangle terribly. Many companies actually use animal hair from the Yak for inexpensive long hair. Then they take the coarse Yak hair, strip off it’s rough cuticle with acid and stretch it with perm lotion for length. Then they bleach & dye the animal hair & lacquer it with silicone.They still sell that to you as 100% Human Hair.Many other companies add 20-30% high temperature resistant synthetic fibers to their extensions, and still have the nerve to call it 100% Human Hair! After a couple of washings, the silicone washes out and loses its luster, the cortex or core of the hair swells up & whatever cuticle is left tangles like the devil. That’s why other hair extension companies’ cheap hair looks like a mop & is good for the garbage a few weeks after you buy it. If you’re still not sure, just ask yourself one simple question: How can anyone sell you hair extensions made of real hair at $100 if they had to buy it from someone who took at least 5 years to grow it & 5 more years to grow it back? It just doesn’t make any sense, does it? 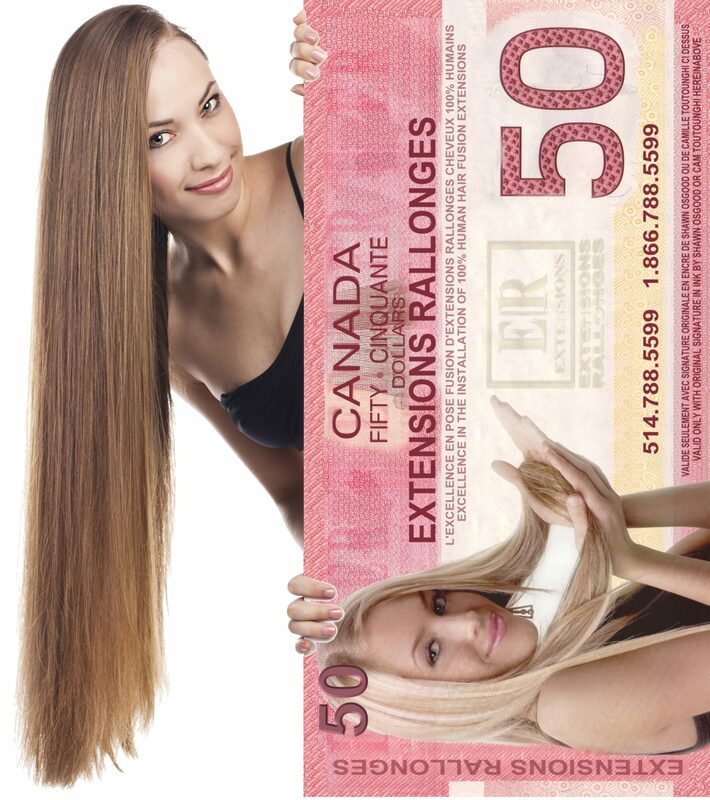 Hot hair is so cool, but so’s a $50 Discount Coupon on your first Fusion Hair Extension Installation at The Hair Extension Center of The Hair Clinic on Crescent Street. At The Hair Clinic, we really can give you the hair of your dreams!